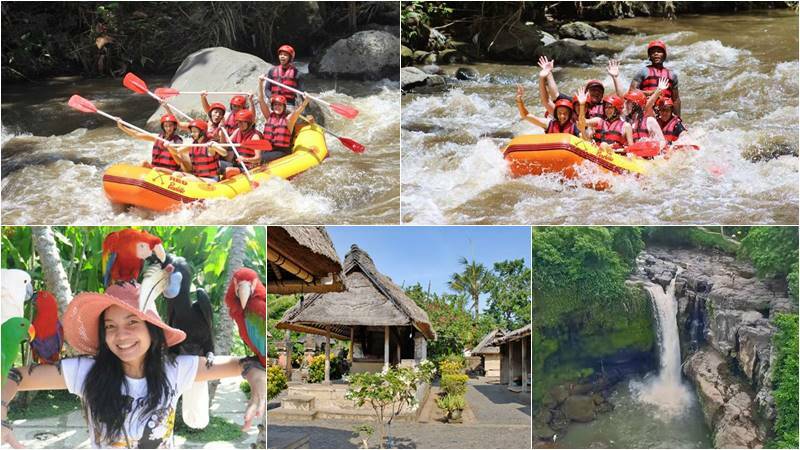 Bali Rafting + Bali Bird Park + Waterfall tour is an interesting Bali Rafting tour package to enjoy the whitewater rafting on the Ayung River, combined with a tour of the Bali Bird Park to see and take pictures of a number of bird species. The tour also visits the Balinese house compound in the village of Batuan and then stops at the waterfall of Tegenungan. This is a really nice holiday tour. 16.00 – Visit Balinese House Compound. 16.45 – Visit Tegenungan Waterfall. Your Ayung river rafting tour begins with morning pickup by our driver with private air-conditioned car from your Bali accommodation and drive through the countryside and arrive at Payangan village, Ubud Bali. After all participants have rafting equipment including lifejacket and helmet, it is time for you to experience a truly unique and memorable epic journey thru winding gorge, luscious jungles, and wild life in its natural homes. Paddle through astonishing waterfalls for unparalleled river fun. Our trained professional guide with internationally accepted equipment will guide you through about 12 km of exciting grades II and III rafting. Your safety is our highest priority always and after 2 hours of fun trip. After your shower and change, the Indonesian Buffet Lunch is served to you while you enjoy views from the stunning restaurant and relax in a peaceful atmosphere of Bali. Balinese’s unique house in which we visit one of the Balinese family and witness how they lived. The unique one is its style, with the family temple, traditional kitchen and stock breeding at the back yard. Take some pictures of this waterfall at the end of the day. It’s one of Bali’s most famous waterfalls, situated in the south of Ubud.